The Prosecutor mandated to oversee the Occupied Palestinian Territory for the International Criminal Court (ICC) stated on Wednesday that her office is keeping “a close eye” on the planned demolition of a Palestinian village in the West Bank by Israeli authorities, warning that, according to international law, it could constitute a “war crime”. “I have been following with concern the planned eviction of the Bedouin community of Khan al-Ahmar, in the West Bank,” said Prosecutor Fatou Bensouda, noting that “evacuation by force now appears imminent” and could result in “further escalation and violence”. “The problem if it happens in all of these [villages], is that then the contiguity and the possibility of a two-State solution will be challenged because the West Bank will be cut in half,” Jamie McGoldrick, the UN Humanitarian Coordinator explained to UN News in an interview on Tuesday. 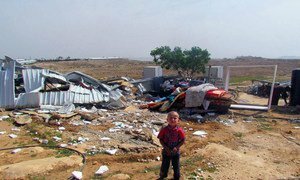 According to OCHA’s latest Protection of Civilians report, over 300 Palestinian-owned structures have been demolished in 2018 alone. “I continue to keep a close eye on the developments on the ground and will not hesitate to take any appropriate action, within the confines of the independent and impartial exercise of my mandate under the Rome Statute, with full respect for the principle of complementarity,” she stated. 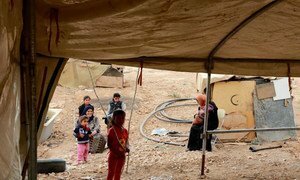 A Palestinian Bedouin community is under threat from a demolition order within days, to make way for Israeli settlement expansion, the UN human rights office, OHCHR, warned on Tuesday.